Same Computer: Computer Remote Control on the Web For Remote Support. Return to your main user page. It seems this computer is currently setup to provide remote tech support. You won't be able to remote control the same computer used for providing remote support. If your trying or testing the system and have access to another computer on your local network, then configure your account for LAN support by entering your computer's private LAN IP address in the "Currently Configured Address" field on your main user page and click the update button (Step 1). Once you've entered and updated the address on your user page to your computer's private LAN IP, login for remote support from the other computer on your network by opening a browser and going to our homepage and entering your viewer id number in the field labeled "Login Below for Remote Support". Don't RDP to the other computer, actually go to it and login to the desktop console. ** Using Microsoft RDP to test is not recommended. Although the client and tech side (viewer) will work through Microsoft RDP sessions (including Microsoft Terminal Server). Using RDP to remote into another computer to act as the role of the remote client is not recommended. If your ready to provide remote support on the web then use the link below to learn how your end-users can get support from you. Click here to see more options of how users gain access to get support from you. From this page you can copy html code that will enable you to add a login form to your own web site. Just copy and paste it into your web site's pages. 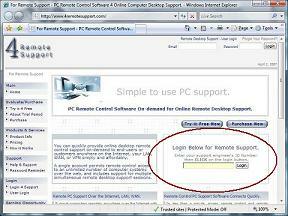 Internet based desktop support solution: Remote PC support is provided to our users as a hosted solution. You are not required to maintain a website or web site links to maintain, no special hardware or devices to buy, maintain, and support. You don't have to spend a thousand dollars per license, seat, or computer like many vendors and support solution service providers do. Remotely access, control and support remotely desktops through the web with no limitations such as those placed on you by other remote assistance service providers with remote support solutions. If the remote desktop has a connection to the internet, even if it is dial-up, and of course the computer works, then it's accessible from the internet to provide remote assistance support using our computer remote control software through the Internet with no restrictions to the number of remote computers a single account can connect to for remote control assistance on the web. If you have your own web site or if you prefer an application or single click type program that your users can download and run to get remote assistance, we have a single-click type app version of remote control support through the web. Our 4Support.exe remote computer support program for remote assistance, can be copied and put on your website from a location that your users can download and execute it. Your end-users or customers can go to your website to connect to you for remote support on the web. The program prompts for your user account and then remotely connects the remote computer to your viewer and then you have remote desktop access and control to provide live tech support and solve the problem.